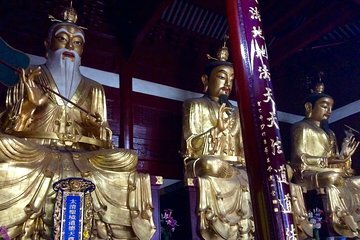 Visit some of Shanghai’s top temples—and discover more about the city’s past—on this full-day, private tour. Meet your guide at your hotel, and get ready to explore Shanghai via public transportation. You’ll see an important Taoist temple in Pudong, will visit a Confucian temple in the Old City, and will discover the Buddhist Longhua Temple, a renowned Shanghai landmark. You’ll also enjoy a traditional Chinese lunch, and will discover more modern history at the Propaganda Poster Art Centre. Tour ends at Propaganda Poster Art Center in French Concession area.